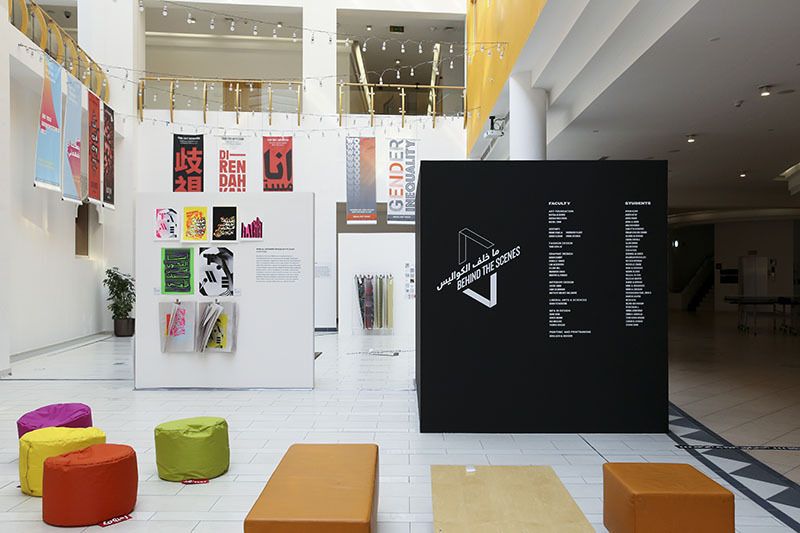 In Fall 2018, I worked in collaboration with Kelly Murdoch-Kitt at the University of Michigan and Basma Hamdy at VCUarts Qatar to engage students in the theme of co-creating tools for community change, an initiative tied to the Designing Across Divides Conference at WVU. 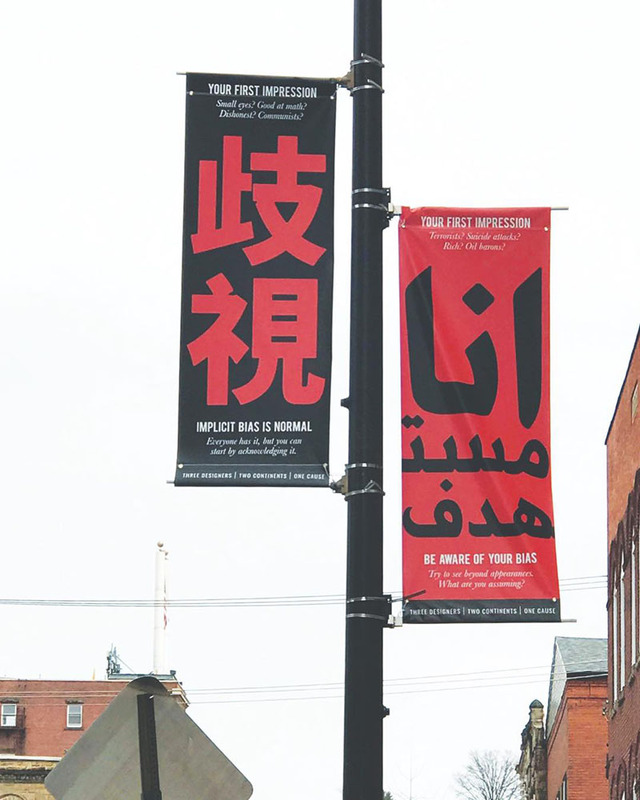 As part of the conference call, graphic designers were invited to design a pair of banners to illustrate how to bridge or address a divide, in a format that would be positioned to the left and the right of a light pole. Selected work would be hung on the streets of Morgantown (West Virginia) during the month of the conference (held March 28-30, 2019), and would be made into a catalog post conference. 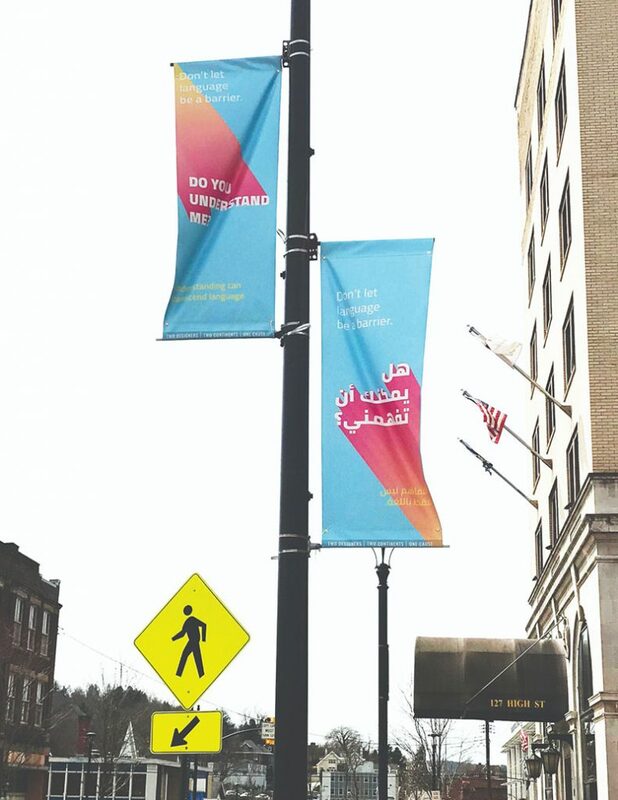 We were excited about this opportunity to bring our research in intercultural collaboration to the fore with students enrolled in our respective Typography courses in Doha and Ann Arbor. For three weeks, our students collaborated virtually via video-conferencing, messaging, and other digital communication tools. 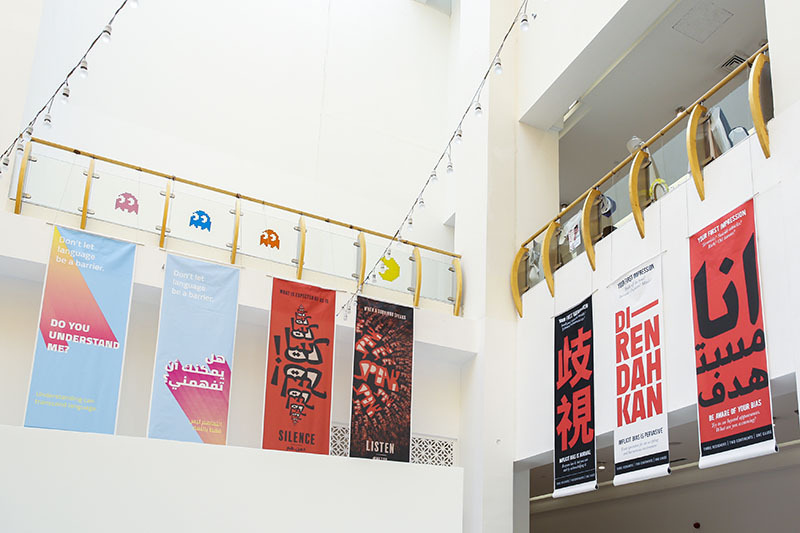 The aim was to address critical challenges and opportunities facing their communities, with the diptych banners raising awareness about the range of sociocultural divides that had personal meaning to the design teams. We were thrilled when we heard that two student teams were chosen for inclusion! We also submitted the collection of banners to the Tasmeem Doha Conference and the co-chairs selected 9 banners for display as part of the “Behind the Scenes” exhibition. 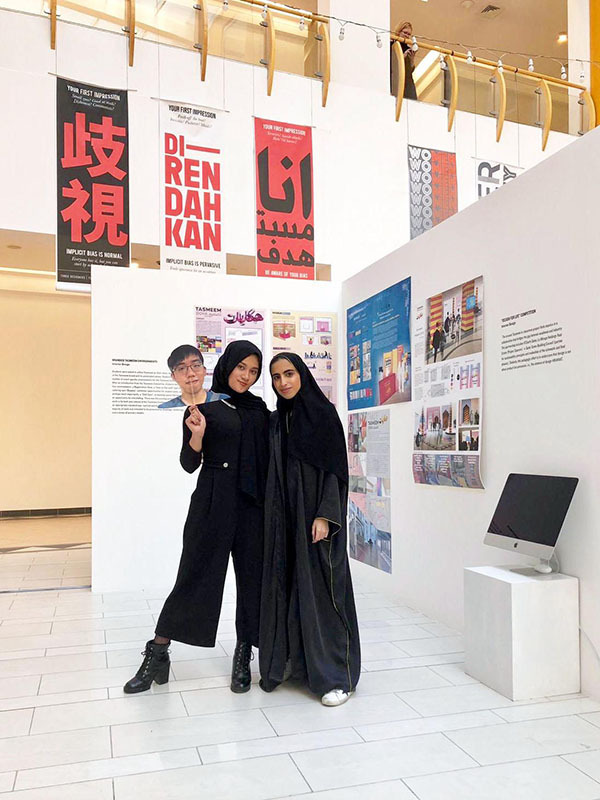 In the following photo, Izza Alyssa and Najla Al Khater stand beneath their triptych banners with a cutout picture of their partner, Edgar Long Kiu Chung (University of Michigan). The trio aims to draw attention to the topic of implicit bias and the importance of surpassing initial impressions when meeting someone from another culture or country. 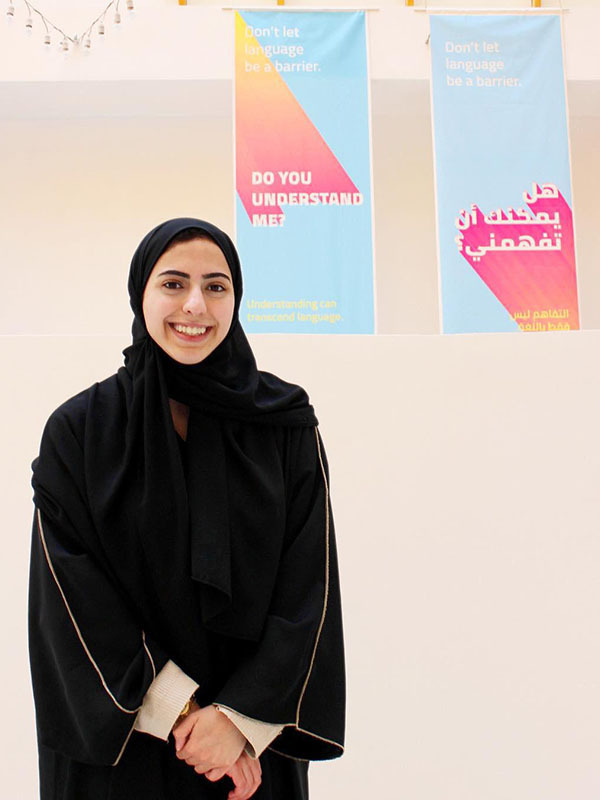 In this next image, Zainab Al-Shibani stands beneath the banners she created in collaboration with Michelle Zhang from the University of Michigan. This design duo worked together to raise awareness about the importance of transcending language barriers in local and global contexts. 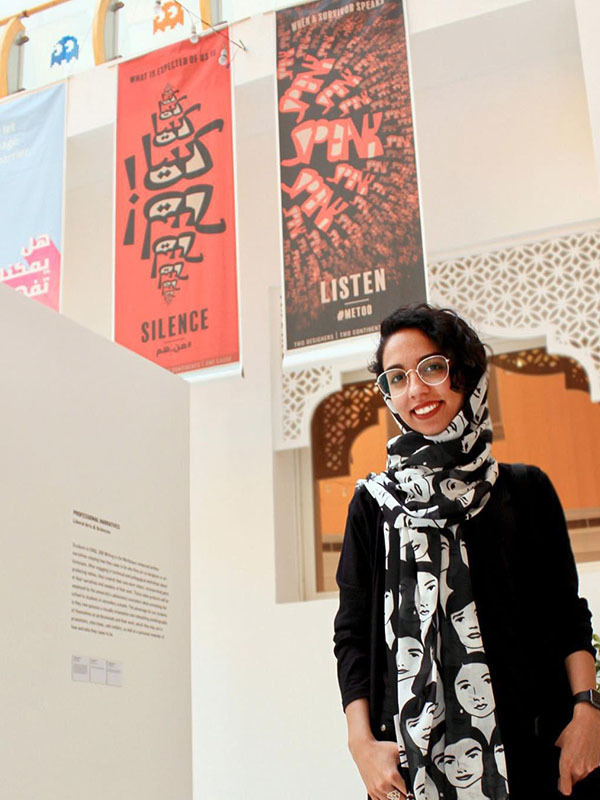 Here, Shima Aeinehdar stands beneath the diptych banners created in collaboration with Melissa Newman from the University of Michigan. The two designers worked together to raise awareness about gender inequalities and the importance of listening to survivors when they share their stories of abuse.